For the next few weeks, I will be trying out some oil pastels I have been given. 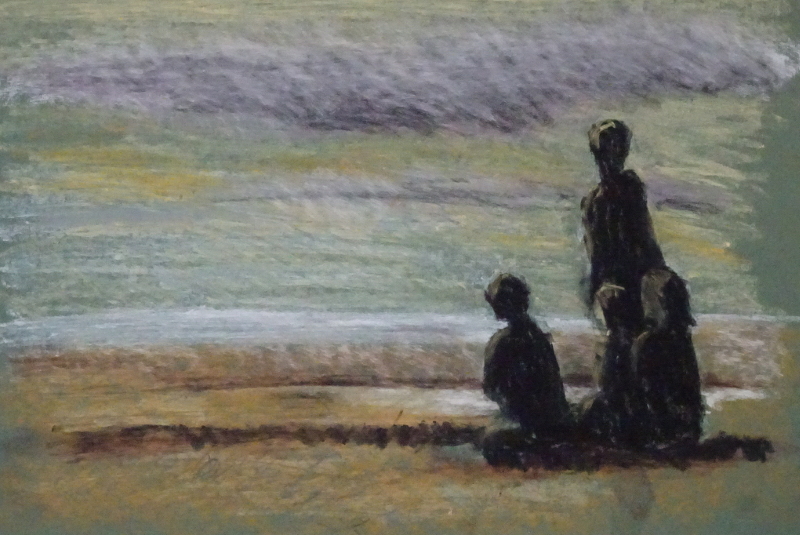 Now I love soft pastels for their immediacy and for the variety of effects I can find. I’ve seen some engaging paintings done in oil pastel, and wondered if they were a good substitute for those who cannot tolerate the dust created when using soft pastels, or who don’t like the feel of them. Well, of course, no medium is a substitute for another. What was I thinking of! Each has its own strengths and challenges. At this early stage of exploration, I could find no correlation between the two, apart from the fact that you have the colour in your hand. I’m using mid-toned green mount board for my substrate for this first attempt. Such work as I have seen used a firm coloured surface to work on. I had been given two sets of oil pastels, and both are rather ancient, but I found an immediate difference in texture between them. One set, the larger of the two named “Holbein”, were very oily, almost waxy when applied, and the surface was too smooth to accept the pastel evenly. Also I had to scrub hard to increase the brightness, and ended by pushing off the pastel already applied. The smaller un-named set were more granulated and adhered to the surface with less effort. Further work discovered a wide range of oiliness to granulation within each set depending on the colour. Clearly there is a lot to learn about the pastels themselves, never mind how to apply them. You can see the uncertain adherence of the pastel. This could be because the surface was too smooth (or the pastels were too oily!) so next week I’ll be using pre-stained canvas to work on. Previous Previous post: Watercolour works!